We experienced another beautiful fall morning on Monday, 29-October, departing the St. Augustine Municipal docks at 0900 to chug further south. Air temp started off around 60F with low humidity and light winds, and sea conditions out in the Atlantic were actually pretty good. That would have been a nice change for us, but the longer term forecast out there wasn’t so attractive, so we stuck to the inside ICW route. Once you get south of St. Augustine the tide variations and attendant currents taper off quite a bit, and that results in fewer shoaling areas in this part of the ditch….although the depths rarely get much more than about 15 feet. Still, it made for a fairly relaxing run, with only a few bridges to negotiate openings; at one we were able to lower the big antennae and squeeze under its 23 foot span by carefully keeping Ghost Rider in the middle of its channel. Temps rose to the low 80’s by mid-afternoon, it was a really nice day on the water. We arrived in the Daytona area just after 1500 and Chelle handled the helm duties for the alongside tie at the Halifax Harbor T-head dock. 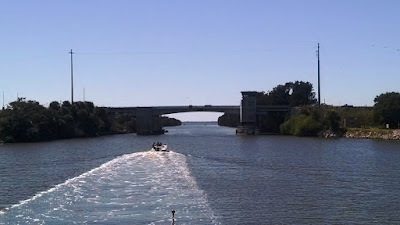 We didn’t bother with hosing down the boat this time as the smooth ride down the ICW didn’t result in any salt spray, so we had ample time for Chelle’s walk and general relaxation. 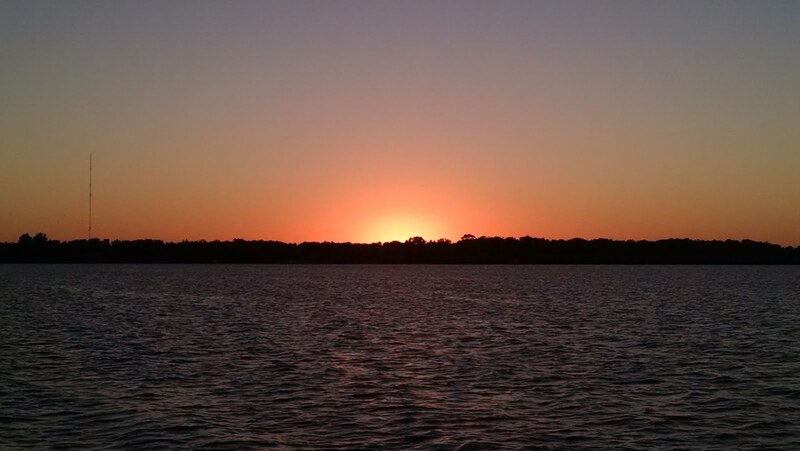 We enjoyed another laid back evening on the docks and boat. It was another delightful sunny morning when we arose just before 0800 on Tuesday, 30-October, although we could detect a warming trend as we plied further south, with temps eventually getting into the lower 80’s. 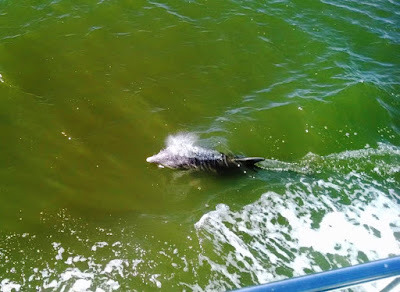 Winds were light out of the north and there wasn’t much traffic on the ICW….unless you counted the numerous pods of dolphin, who apparently like to hunt this entire stretch of narrow waterways. From Flagler Beach all the way down to the Canaveral area we had flurries of Bottlenose action going on around us, and they frequently flew formation with Ghost Rider for long spells, both on the bow and alongside. At our leisurely 8.5 knot pace, they didn't have any problem keeping up. (Video LINK HERE.) We did have several bridges to negotiate, but we could scoot under all the low ones without waiting for an opening by lowering the big SSB and VHF sticks. One in particular was a bit tight – the George Musson bridge’s sideboards showed just over 21 feet at the edges (we need 23 feet with antennae down) but there was an extra two feet in the middle that provided just enough clearance. It was a smooth ride all the way down the ditch to the Canaveral area, although depths did diminish a bit in a few areas, showing less than four feet under the keel. We were riding a bit low after taking on that load of fuel back in Fernandina, so we were pretty religious about keeping to the center line of the channel. Around 1715 we approached our planned anchorage just west of Merritt Island, dropped the hook in 12 feet of water, and got a solid set on the first attempt. 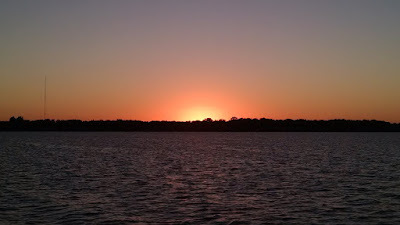 As the sun dipped below the horizon temps cooled to a very pleasant range and we were again able to open up the boat and sleep without running the generator. Wednesday, 31-October brought us another fine morning, sunny with mid-70’s and just a tinge of humidity in the air. After cranking up the genset for some battery charging we tended to our usual weather and email checks, picked up the hook right at 0900 and continued motoring south down the ICW, with Fort Pierce as our destination today. We found slightly deeper water on this sortie and about the same number of Bottlenose dolphins as the day before….not exactly a swarm but on occasion it was close to that, and once again they seemed to enjoy the formation flying. ICW traffic was a bit heavier today, and most seemed to have no passing etiquette whatsoever – we got rolled around a few times by big cruisers digging big holes in the water. We would just arm the stabilizers while Rick imagined firing a post-pass stern shot torpedo. We had several bridges with which to deal once again, but we were able to squeeze under all of them after lowering the big sticks. Along the way we got pinged by Ron and Mercedes aboard N47 Moonrise, who had departed Charleston a few days earlier and were now running long on the outside about 20 miles ahead of us. 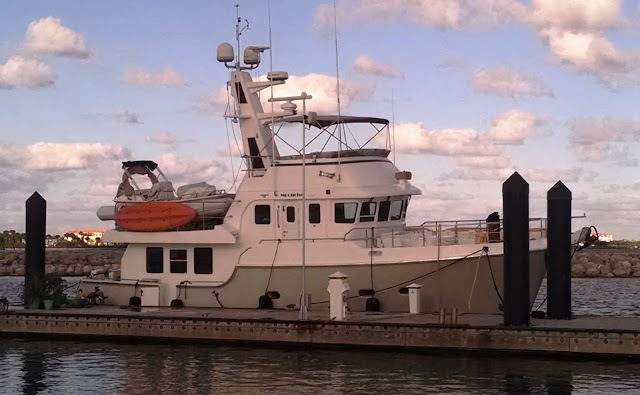 They were looking for a port to get some rest, so we recommended the Fort Pierce City Marina if they cared to hook up….and that’s how it played out. They arrived there mid-afternoon and we pulled in around 1600, both of us fortunate to get easy alongside slips on the concrete floating docks. After tending to post-flight duties and a quick hose down of the boat from the rub rail down, we cleaned up and relaxed a bit. We met Ron & Mercedes at the marina restaurant around 1830 and enjoyed a tasty Halloween dinner on the deck with them, then moved the party to Ghost Rider's salon for a nightcap. We slept in the morning of Thursday, 01-November waiting on a good (incoming) tide cycle before starting our final leg down the ICW. The sea forecast out in the Atlantic was rather confusing….nearby they were calling for four to six feet but at 12 second intervals, which sounded just fine; but for the next zone to the south the prognosis was for five footers at five second intervals – that would be no fun at all. By 1030 the winds were already up to 20 knots out of the south, and that cinched it for us – it would be another day running down the inside. By 1100 we were back out in the channel motoring south and doing our best to keep to the centerline; we expected several shallow stretches today. By noon we had an air temp of 80F, humidity back up at 61%, and that stiff southerly breeze even churned some open parts of the ICW with a short, square chop up to a foot. As long as we didn’t start bouncing off the bottom the decision to run inside was looking good. 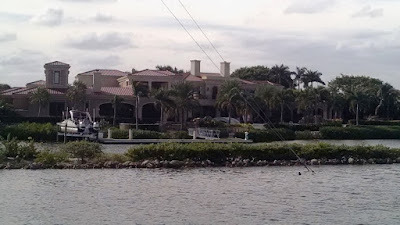 Just after 1300 we reached the St. Lucie Inlet / Stuart area where we knew we would encounter the skinniest water depths; the combination of the St. Lucie River intersecting the ICW and the ocean inlet made the area notorious for currents and shoaling. At one point we saw 1 ½ feet of depth below the keel but that was the worst of it and we slipped through that dicey area without incident. The remainder of the trip was uneventful other than having to negotiate numerous no-wake zones and a lot of bridges, but once again we found we could squeeze under them by lowering the two 23 foot antennae. We arrived at the entrance channel to Old Port Cove just before 1700, but took a slight detour south into the big Lake Worth channel for about 15 minutes – this was the only stretch where we could put Ghost Rider through her wide-open-throttle (WOT) paces. Once that was completed we turned back north to OPC and were docked up shortly thereafter. After we got the boat and ourselves cleaned up James Knight and Jay Flaherty from Yacht Tech (our preferred service center – LINK HERE) stopped by for a drink, but more to chat about the “punch list” we had sent them a week or so ago, and just generally catch up on Nordy community news. 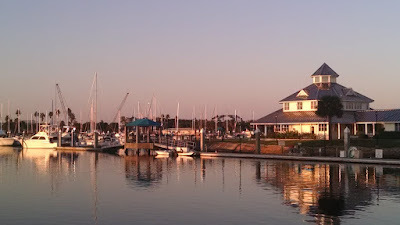 Later we placed a to-go food order with the marina’s Sandpiper restaurant and enjoyed a relaxing dinner on the boat before crashing into our comfy bunk for a good night’s sleep. 1,000 Nautical Miles from 30-Sep to 01-Nov.
During this break we’ll fly to the Midwest to visit with family in St. Louis and Quincy, and also attend an annual charity event about which we’re passionate; and hopefully by the time we return the boat business will be largely completed. After that we’ll find a weather window to bring Ghost Rider around the state and back to her home in Fort Myers, where we’ll spend the winter and enjoy the holiday period with friends and family. 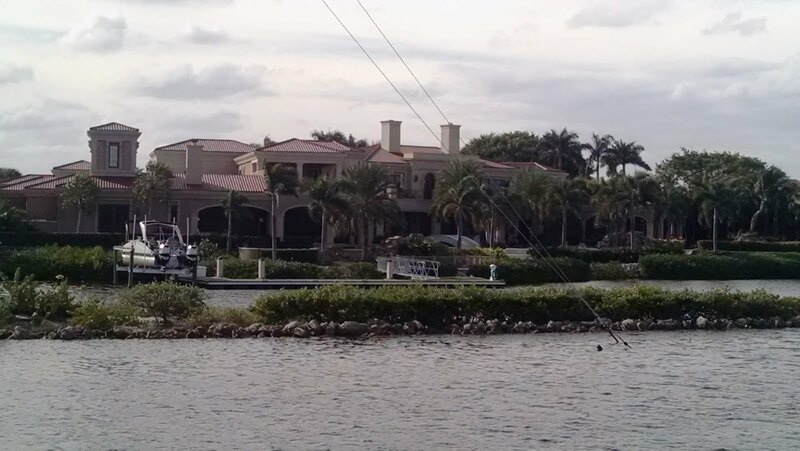 So while we do not yet have the boat back to her home port, we are close and at least back in south Florida. We seemed to have survived this tropical storm season without much drama and were able to make every region and port we had set out to visit. Since March we had covered over 3,700 nautical miles, burning approximately 1,900 gallons of diesel fuel in the process, going as far north as Baltimore, MD while also diverting to the Bahamas for over a month along the way. We visited old friends and made new ones, and largely managed to stay in good health the entire time. Overall Ghost Rider performed brilliantly, although we learned that a 16 year old trawler can get somewhat expensive if you are serious about keeping its systems in good tactical condition. Lastly, our own acts of occasional stupidity were relatively few and recoverable, while we continued to learn a lot along the way. And we don’t believe we damaged or injured any humans, animals, property or the environment in the process. 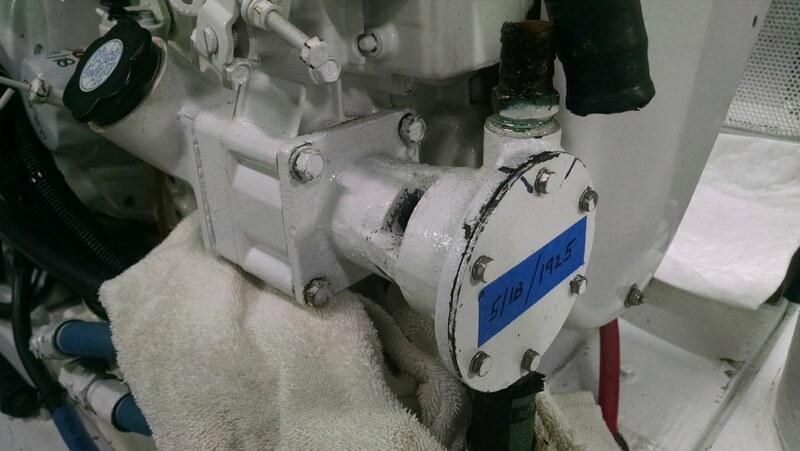 ** Replace the generator’s raw water pump….it had developed an intermittent water leak that currently only manifested after shutting the unit down, but would eventually fail. Rick already had the new part on hand and actually completed this one today...pics at the bottom of the page. 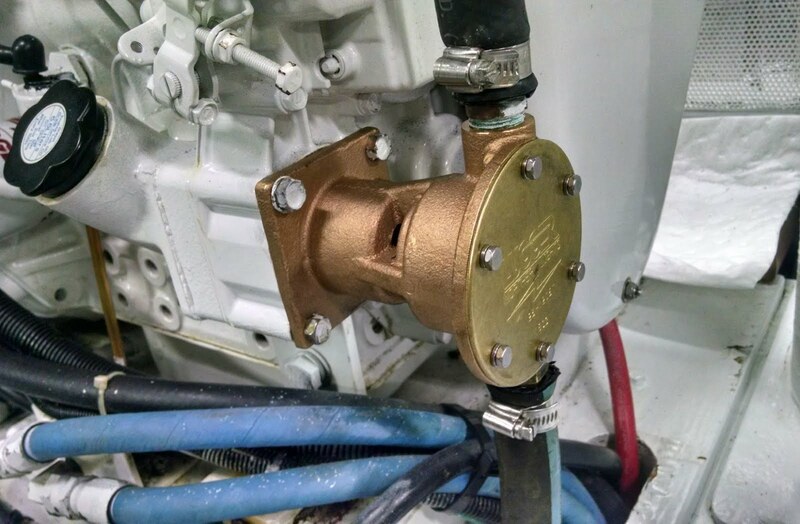 ** Fix two main engine oil leaks, one at the front bearing oil seal, the other at the base of the dispstick housing….we have been dealing with these since purchasing the boat and we want to get them permanently addressed. ** Replace both the A/C compressor and air handler for pilot house…only the compressor is actually dead (frozen piston) but unfortunately at 16 years old Cruisair no longer makes a drop-in replacement and a new R-410 refrigerant system is required…which involves a new & compatible air handler, too. ** At the same time we want to have the entire A/C system flushed with “Barnacle Buster”….in the warm waters where we travel that’s simply a must-do every few years. 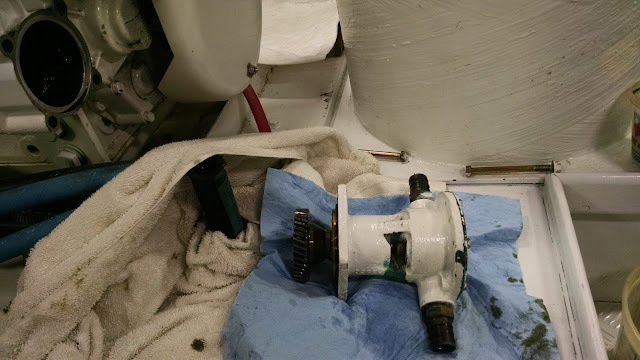 ** Both stabilizer actuators have oil leaks….Rick’s guess is the feedback valves are scored (again), with the starboard side being worse (we’ve already replaced that one twice); we want to get the Naiad techs aboard again to inspect and assess. ** Repair a leaking line connector on the water maker….it’s some kind of proprietary quick connect joint that we had “fixed” with a wrap of rescue tape. ** Annual hydraulics maintenance is due….generally that involves replacing the cooling pump impeller & return filter, and lubing any u-joints in the drive mechanisms; Rick wants to observe and learn how to do it himself in the future. ** Both the wing engine and generator are due for a coolant flush & maybe a couple of hose replacements, plus pencil zincs; Rick wants to observe and learn how to do these himself in the future without flooding the engine room with antifreeze solution. ** Then there is the standard spare parts refresh, including some miscellaneous zinc anodes plus air and coolant filters for the main engine, and some new weather stripping so Rick can repair the fly bridge hatch rain water leak. Removed and Installed on the New Replacement Pump, and That Turned Out to be a Chore. to Confirm No Leaks and Normal Operating Temps. All Good.